2018 has been my summer of using the materials I’ve been making and this bag is a fusion of some of the hand dyed fabric and silk papers. I call it experimental because I want to see how the silk paper holds up on the bag before I offer this type of work for sale. So far it’s holding up well for light everyday use. The bag is 6.5″ x 11″ and the handle is some of the ribbon I’ve been dying. This was the first time I used gunmetal grey in the dyes. Many of the pieces came out with an interesting camouflage look. 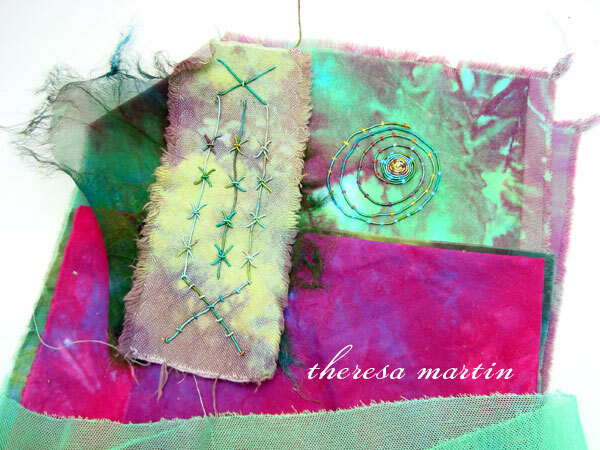 Categories: Blog | Tags: bag, hand dyed fabric, Mixed Media, purse, silk paper | Permalink. 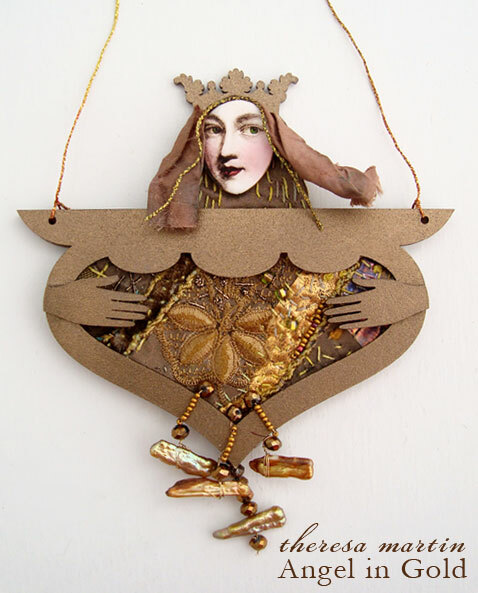 Every month there is an ATC (Artist Trading Card 2.5″ x 3.5″) trade at Artistic Artifacts in Alexandria. 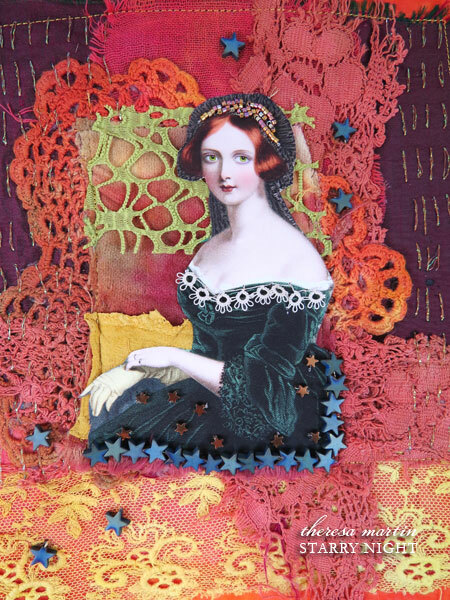 My offering will be 12 small fabric digital collages. On wispy see through organza I printed out a collage which I placed over hand dyed fabric. 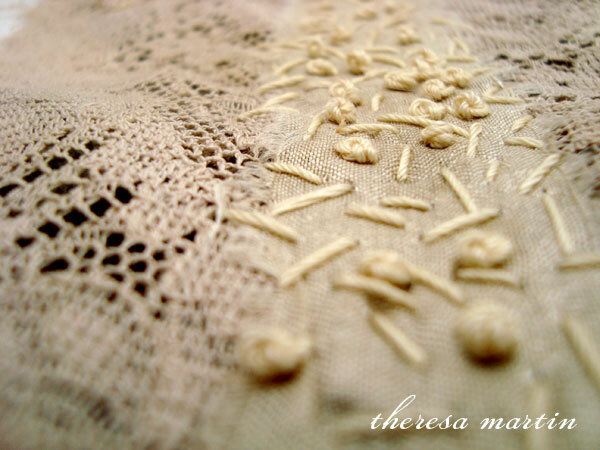 They were then stitched with gold metallic thread. Soon I will be teaching this technique at Artistic Artifacts. 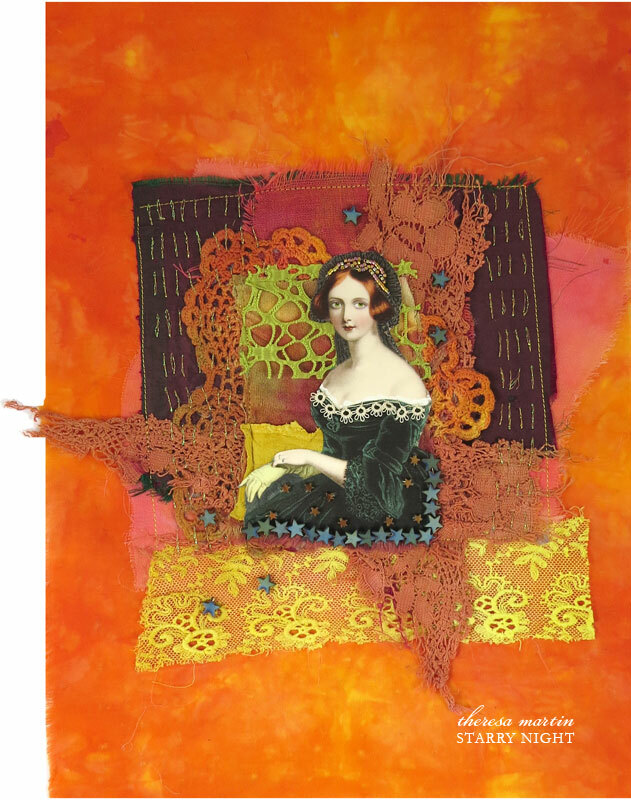 The class will be in two parts, beginning with the digital collage aspect. The second class will cover making a print out and selecting fabric for the design. Details will be posted here as soon as I have the dates! 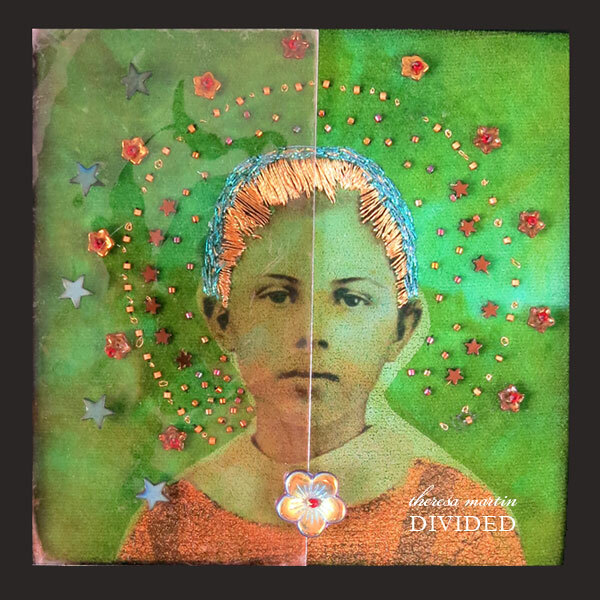 Categories: Blog | Tags: artist trading cards, artistic artifacts, ATC, collage, Digital Collage, digital collage class, hand dyed fabric, Mixed Media, organza | Permalink. 10″ x 14″ Mixed Media. 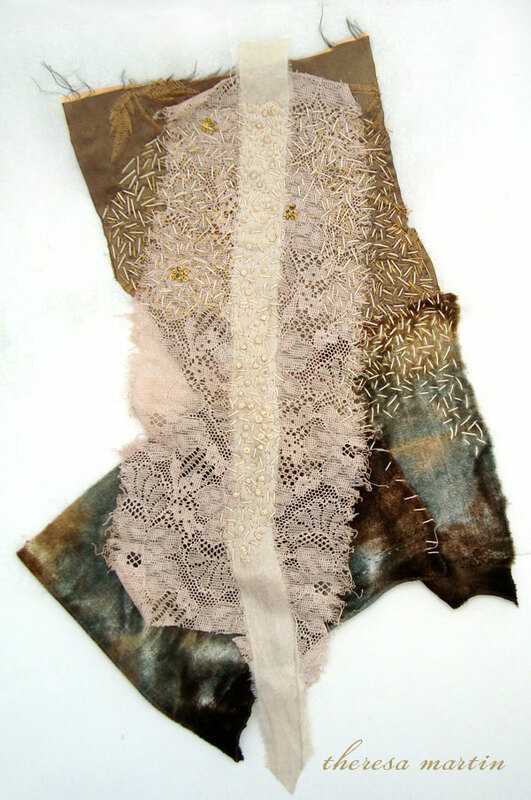 Hand dyed fabric and lace, hematite stars, embroidery and paper. 6″ x 6″ Mixed Media. Embroidery on hand dyed velvet, glass beads and hematite stars, mica. 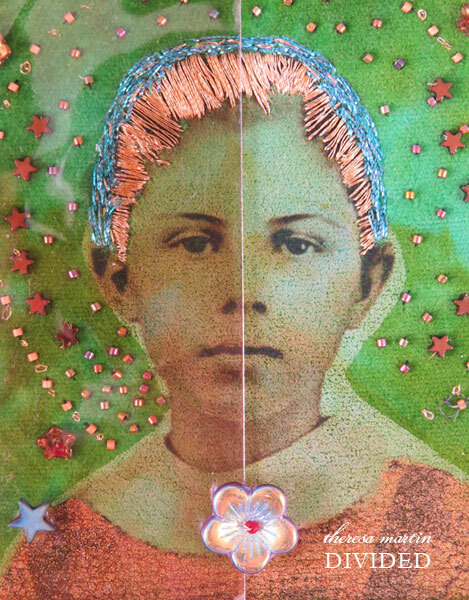 Categories: Blog | Tags: embroidery, hand dyed fabric, hematite stars, icon, Mixed Media | Permalink. On the work table, off the table and under the table. On the work table now is a piece of free stitching in neutral tones with vintage off white thread and some metallic touches. This is what it looks like when I’m working on it up close. This is what it looks like overall. I will keep adding to this piece and have nowhere in particular that I want to take it. It is a wandering, freeform piece. I like the colors and the density of the stitches. This angel is off the table now. 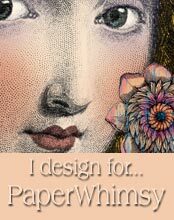 It’s the latest paperwhimsy.com piece and you can read more about it here. It’s available on Etsy. After working with muted tones, I craved a bit of color. Here is what I’ve gathered for a future piece. I’ve begun some stitching for what will be more of a collage piece than a wandering piece. The fabrics are hand dyed and I am using Painter’s Threads. 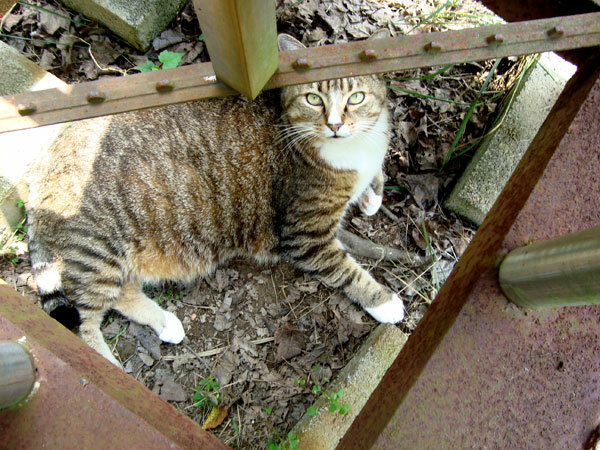 I spotted him quietly keeping me company under the photography table. He looks like the first neutral toned piece above. 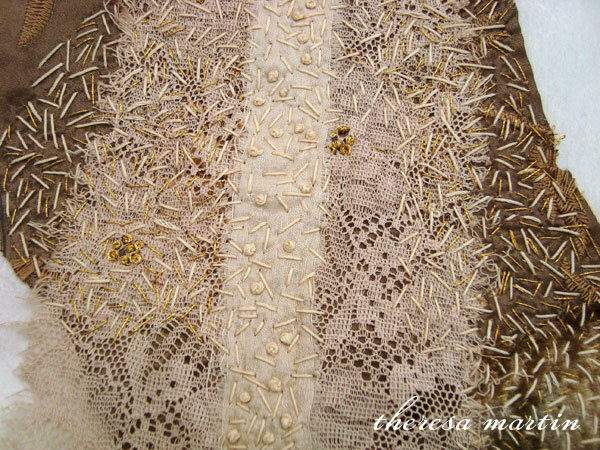 Categories: Blog | Tags: embroidery, free form stitching, hand dyed fabric, Mixed Media, paperwhimsy, slow cloth | Permalink.